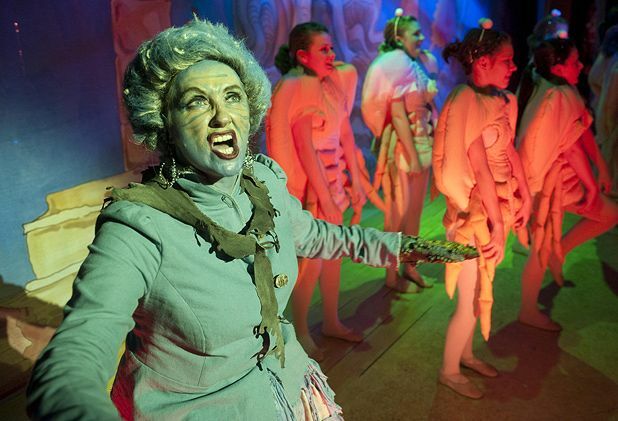 Brunton Theatre’s panto tradition is in great health with several years of packed-out runs behind it. The detailed local references make the show all the more bespoke to its location, and about as far from an off-the-shelf show as you could imagine. The 2009 season is no exception. With the action set on Fisherrow Harbour, literally a five-minute walk away, there references to local environment and culture throughout, from the Bass Rock, under which Atlantis lies, to Tranent, where ‘there be monsters’. Even the voyage taken by the motley crew takes in Musselburgh’s twin town of Champigny-sur-Marne in France. Central is the love story between Gavin Paul’s Sinbad and Coral the mermaid (Julie Heatherill), who spends most of the show en pointe to signify her leg-less state. In hot pursuit of Coral and the pearl of beauty is the evil witch Crabsclaw, a fantastically evil and glamorous Isabella Jarrett. Featuring enough costume changes on the part of Craig Glover’s dame Saucy Nancy to rival that of a big-budget Madonna spectacular, plenty of slapstick, crowd interaction and colourful set design, the show is visually impressive throughout. And with contemporary references ranging from Subo to Britain’s Got Talent and recent pop songs, it feels very modern. No audence member should leave unsatisfied. A brand new panto written and directed by Liam Rudden, containing the pick of panto's best-loved seafaring characters and given a local twist.